The hand has natural peaks and valleys determined by the bones in the hand. The high points of the bone rub against tools and equipment and cause blisters, calluses and hand fatigue. 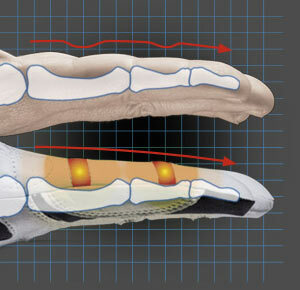 Strategically-placed pads on the glove eliminate the peaks and valleys and even the surface of the hand. 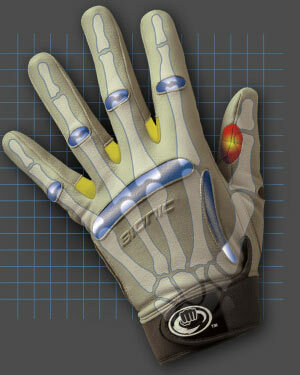 Bionic improves grip strength, without the need to grip harder, and reduces hand fatigue. Plus, friction causing blisters and calluses is virtually eliminated. Your fingers are “pre-rotated,” which means the forefinger and pinky rotate inward toward the center of your hand when grasping an object. Bionic is more comfortable, feeling like a “second skin,” and moves more naturally when gripping. The hand features 14 phalanx bones and a large number of tendons and muscles. Combined, they allow for an intricate range of motion and dexterity. Made of stretchable and breathable Lycra material, Motion Zones are added over the knuckles and Web Zones are added between the fingers. 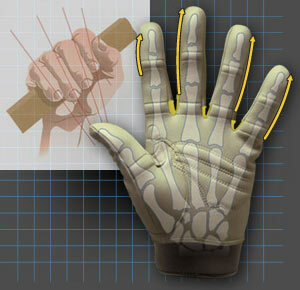 Bionic provides greater flexibility and natural dexterity, while also helping keep hands cool and dry.